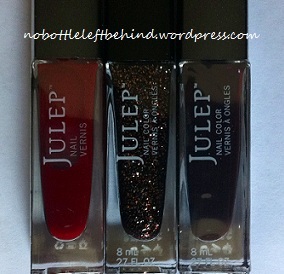 I really am so in love with Julep’s December box. I haven’t found a color yet this month that I don’t like. Julep Julia is proof of how awesome it is. Julia is an orchid purple with tons of gold shimmery micro glitter throughout. I can’t even put into words how in love I am with this color. It’s so stunning. 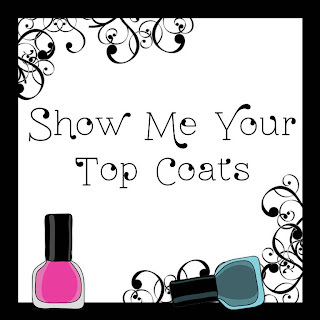 I think I’ll be using this one again soon in one of my days of the nail art challenge ;). *** I forgot to add that this is 3 coats of Julia and 1 coat of HK Girl Fast Dry Top Coat . Welcome back! I’m glad you stopped back by to find out what the “mystery” was. 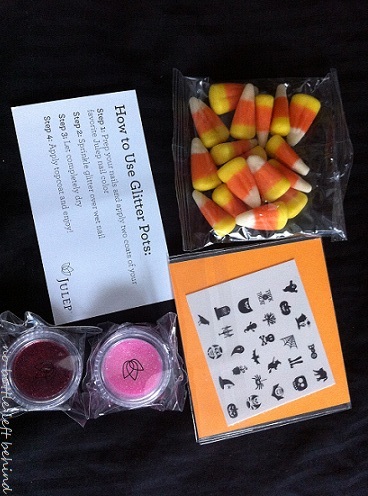 I received my October Mystery Trick or Treat Box from Julep. I almost missed out on this box. Which would have been a first since I became a Maven. Luckily I was able to snag one up last minute. They promised we would receive them by Halloween for the special little treats inside and they did not fail. 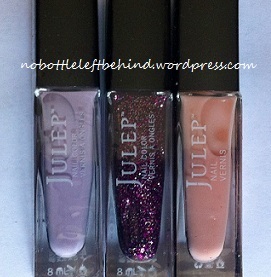 Have I ever mentioned how much I love Julep? Since other Mavens have already been posting what they received in their boxes I kind of had an idea of what would be in mine. 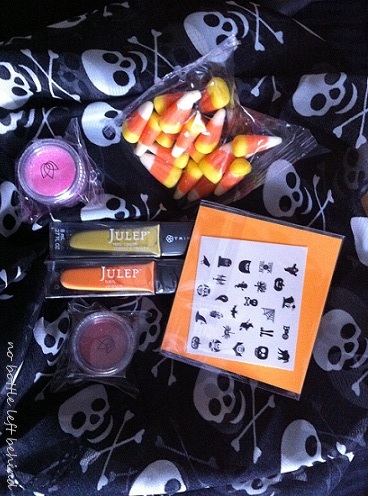 In Julep’s sneak peak they showed that some boxes would have a skull scarf, skull ring, or skull bracelet. 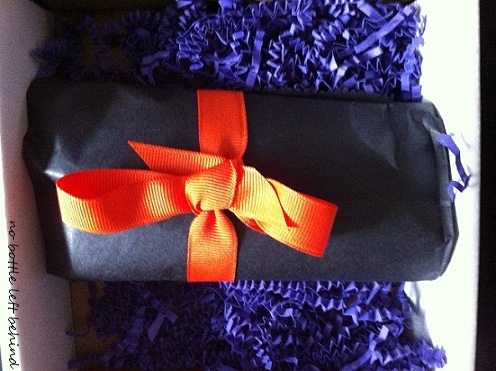 As more and more people were posting their boxes it seemed like maybe only the first few people who ordered received the awesome Halloween surprises so I wasn’t hopeful for one. But alas, I ordered my box anyways. So enough blabbing, let’s see what’s inside! 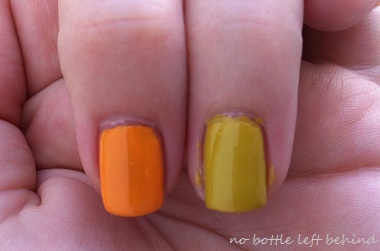 Along with the glitter pots are some yummy Candy Corn (my son will probably devour those) and Halloween nail decals. So cute! The nail decals are from AlexCole Designs and you can purchase them in their Etsy shop. I’ll be using these soon for another Halloween mani. The scarf!!! 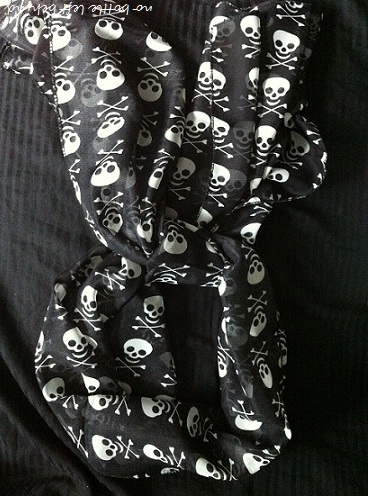 I got the scarf! How did I get lucky? I don’t know because I have the worse luck in history :). I can’t wait to wear this on Halloween. My son is dressing up as a pirate so how perfect is this? So there you have it. 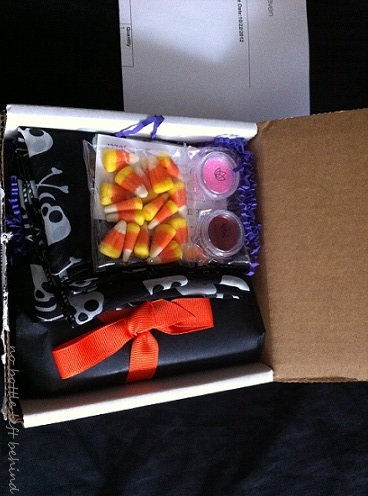 My October Julep Maven Mystery Box. What did you think of it? 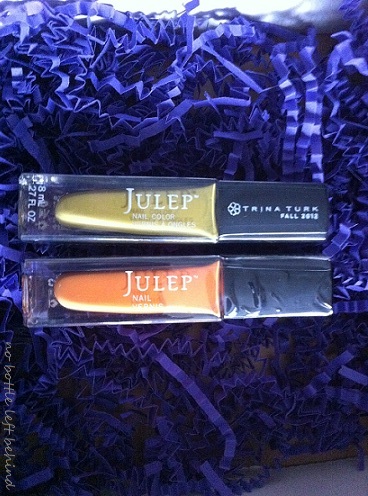 I received Sophie and Brandt in my Julep Maven September box. I never did use them because at the time I had an overwhelming amount of polish to try out and these colors just weren’t at the top of my list. They’re darker colors and I was still in summer brights mode. I figured since it’s October and these are warmer fall colors that I’d go ahead and try them out. 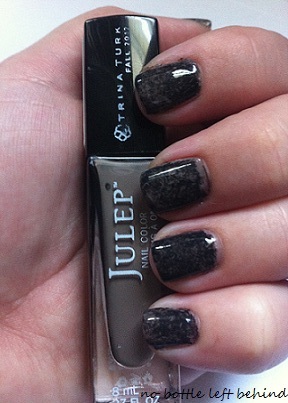 Sophie is described by Julep as a chic truffle mushroom creme. Brandt is an off-black creme. Both of these colors are from the Tina Turk Fall 2012 collection. I was surprised by Sophie when I put it on. It seemed to have a bit of a purple hue to it. Maybe it was just my eyes but it was prettier than I thought it would be. I wanted to try something different and still be able to use Brandt as well so I decided to try out a Saran Wrap mani. This was my first attempt at this type of mani but I was pleasantly surprised by how it turned out. I started out by painting two coats of Sophie for full opaqueness. Topped that with a coat of Seche Vite and let it dry for about an hour to make sure both layers were good and dry. Next I pulled out my Saran Wrap and made a wad with it. This was pretty easy to do since Saran Wrap wants to wad up all the time anyways. Easy Peasy! I painted one coat of Brandt over top of my pinky nail. Gave it a couple of seconds to get sticky then dabbed my wad of Saran Wrap over top of the nail a few times to give it sort of a tie dye look. Repeat on each nail, one at a time.